HAVE A CHANT FOR KIERAN GIBBS!?! I'm not going to lie; this game worries me a bit for a few reasons: it's away from home against a team fighting for its Premier League life, who are managed by Mark Hughes and captained by Joey Barton. And we'll have Mike Dean as the referee. It's like the perfect storm. Arsenal won comfortably last week at home against Aston Villa, while QPR had their backs pushed farther against the wall as they lost to Sunderland and finished on ten men. The R's are one point and one place from safety at the moment, but 17th place Bolton has a game in hand. Arsenal have won seven straight league games and can make it eight for the first time in eight years with a win tomorrow. But, it won't be that easy. Road games against sides battling relegation are always going to be tricky, and Arsenal will have to do that twice in the next three games (they have Wolves at Molineux April 11,) with a visit to the Emirates from Manchester City in between. This fixture is not as easy as it looks on paper, even if a month ago I called it one that Arsenal for sure had to win to finish in the Champions League places. And, let's face it. Arsenal do have to win here. There's no reason to put the handbrake back on. Why would you try to coast down the highway with the handbrake on? "drizzzzzzzy," which has seven Z's. Photo: Twitter. The major question mark of the week surrounds the knee of Laurent Koscielny, who pulled out of the squad at the last minute with tendinitis last Saturday. From everything I've read, the problem does not look to be serious, and the Frenchman himself is confident he'll play tomorrow. With no reserve matches scheduled until next month, Arsenal surreptitiously scheduled a match against a Reading XI played behind closed doors in order to get a few fringe first teamers some playing time. The match saw the likes of Marouane Chamakh, Park Chu-Young, Carl Jenkinson, Sebastien Squillaci, Ignasi Miquel, Andre Santos, Aaron Ramsey, Alex Oxlade-Chamberlain, Yossi Benayoun, and Abou Diaby play. It ended 1-1; Arsenal's goal game from Park. Since it was behind closed doors, we can really only rely on bits and pieces of information, but it does worry me that Arsenal's B-team can only draw what was presumably Reading's B-team. But, these are guys that are short of match sharpness, so how much can you really read into a result like this? It's not like the scoreline really matters. Still, PANIC! As for Arsenal's wounded, here's the round-up: Francis Coquelin's timetable as of two weeks ago should put him back in training around now, but he'll still be well short of match fitness for a week or two. Per Mertesacker did some light running, about 20 minutes or so, on Tuesday. Emmanuel Frimpong is still DENCH and still out until autumn, leave it. Now we come to Jack Wilshere. As of last week, Jack was "back with the ball," according to Arsene Wenger. That put him, best case scenario, three weeks away from a return to full training and from there, it's another two weeks until match fitness. So, that's five weeks, at best, as of a week ago. Four weeks at best, now. This would put Wilshere in line for a return on April 28th at Stoke. I think the most likely scenario is that he makes the bench for the final game of the season at West Brom and comes on for a cameo appearance if Arsenal's ahead comfortably in the final ten minutes. That's what happened when Johan Djourou did his knee on international duty two years ago. Predicted XI: Szczesny, Sagna, Vermaelen, Koscielny, Gibbs, Song, Arteta, Rosicky, Gervinho, Walcott, van Persie. 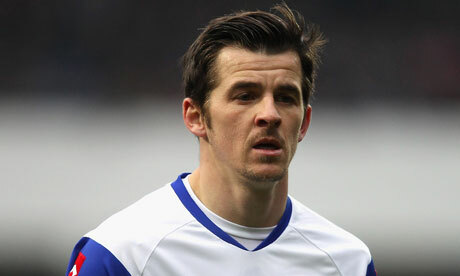 Is it fair to call Joey Barton a hipster? He'd fit in nicely in Williamsburg. Photo: Guardian. Damn it! No Armand Traore! The ex-Arsenal left back is out until at least next week with a hamstring injury. Meanwhile, on loan Federico Macheda has been sent back to Manchester United for treatment on his ankle injury, meaning his season is likely over. Other injuries include season long ligament injuries to Kieron Dyer (ankle) and Alejandro Faurlin (knee,) neither of whom are any longer in QPR's 25-man roster. Djibril Cisse picked up a straight red card in QPR's 3-1 loss to Sunderland last week, meaning he'll now have a total of seven matches missed through suspension by the end of this ban, to go along with his five matches played with the club. QPR look to be boosted by the return to training of two of their forwards who have been out for two months each with their respective injuries: leading scorer Heidar Helguson from a groin injury and DJ Campbell from a hamstring injury. Arsenal have currently won seven straight games in the league for the first time since 2007. 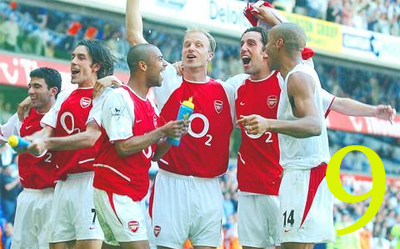 The last time the Gunners won eight straight in the league, it was part of a streak that eventually reached nine. This was in 2004 and it was part of the Invincibles run. When that streak started, the Invincibles were second place in the table behind Manchester United, who had lost a few games but had fewer draws and more wins, hence more points. After the nine match winning streak snapped with a 1-1 draw with United at Highbury, Arsenal were seven points clear of Chelsea at the summit and 12 points clear of United in third. Incidentally, that 1-1 draw was came eight years ago this week (on March 28, 2004.) Arsenal's last winning streak of about this length, six games, in 2010, was snapped on March 27. Thankfully, this match is already after those evil, evil dates! Extending the streak to eight wins would tie this for the eighth longest league winning streak in club history. The record is 14 (which spanned two seasons in the calendar year 2002.) The longest winning streak contained in a single season is 13 (the first 13 wins of that 14 match run I just mentioned.) You'll recall they won the Double that year. Tomorrow's game at Loftus Road will not be televised in England. The Gunners are now unbeaten in 29 straight games not shown on TV, dating back to the 3-2 loss to West Brom in September of 2010. Arsenal have eight wins from eight games played at 3:00 p.m. English time on Saturday, which is when they'll be playing tomorrow. They have conceded only one goal in those eight games total, at Sunderland last month. And that was the pitch's fault! Arsenal's winning streak across all competitions currently stands at six (dating back to the FA Cup loss at the Stadium of Light) which matches their longest winning streak from last season. That streak was snapped in the Carling Cup Final. Arsenal's road winning streak across all competitions stands at just two, though it is three straight in the league. As for QPR, they have been as high as 9th in the table this season, but were 17th on the day Neil Warnock was sacked, January 8. In ten league games since that date, QPR have won twice, drawn twice, and lost six. They have only one win from their last eight league games: last midweek's stunning come from behind 3-2 win over Liverpool. They have gotten wins from Liverpool and Chelsea at home this season, and deserved at least a point for their performance against Manchester City, though they lost 3-2. Guess who had the winner against QPR in December? This is QPR's first season in the top flight since 1995/96. In the reverse fixture on New Year's Eve, it was Robin van Persie's goal on the hour mark that gave the Gunners a classic "One-Nil to the Arsenal" victory. The last time Arsenal played a league match at Loftus Road, it was a 1-1 draw in 1996. A 49th minute goal from Dennis Bergkamp earned Arsenal a point, canceling out Kevin Gallen's first half opener. Arsenal's last match overall at Loftus Road was in an FA Cup tie in 2001, which the Gunners won 6-0. Chris Plummer opened the scoring for Arsenal that day, which was kind of him, seeing as he played for QPR. QPR had another own goal in the mix, Sylvain Wiltord had a brace, and the scoring was capped by Robert Pires and Dennis Bergkamp. Arsenal's last league win at Loftus Road was in 1990, by a 3-1 scoreline. Four of the five since then have been draws, with QPR winning the other 3-1 in April of 1995.
this photo of an exasperated Hope Solo came up first. That makes sense, right? Photo: HSPN. The referee is Wirral-based unmitigated disaster Mike Dean. Arsenal finally broke their winless streak against top flight sides with Dean in the middle on February 26, in the 5-2 North London derby win over Spurs. While Dean did send off Scott Parker, the game was already decided by that point, and the decisions that came beforehand rarely went Arsenal's way. You'll of course recall Gareth Bale's tumble and the ensuing penalty that made it 2-0 in the first place. Prior to the derby win, Arsenal's form with Dean in the middle was: D-D-L-D-L-D-L-L-W-L-L-D-L. That one win in the middle was the FA Cup replay at Elland Road against Leeds last January. Arsenal's last win before Tottenham in a Mike Dean match against a top flight opponent was at Stamford Bridge in November of 2008. This year, the previous matches with Dean were the 2-1 loss at White Hart Lane, the 1-1 draw with Fulham, and the 2-1 loss to United at the Emirates. As for Queens Park Rangers, Mike Dean has only worked two of their matches this season and they came two weeks apart. Dean was in the middle for the West London derby FA Cup tie that saw QPR bow out to Chelsea 1-0 on a Juan Mata penalty. Two weeks later, QPR lost again with Dean in the middle, this time in a relegation six-pointer at Ewood Park, to Blackburn Rovers, 3-2. Since working the North London derby, Dean worked the Tyne & Wear derby that ended 1-1 between Newcastle and Sunderland with two red cards. Dean was dropped to the Championship the next week, then dropped to League Two a week after that before working the Manchester City v. Chelsea game on March 21.
reverse fixture. Too much to ask for this time? Seven weekends and eight rounds of fixtures remain in the 2011/12 season and the picture is becoming clearer regarding what teams are fighting for what spots. City and United are the only conversation for the title. The relegation fight still includes five sides: Blackburn, Bolton, QPR, Wigan, and Wolves. The battle for European places is splitting a bit and Liverpool is spiraling out of the picture. Bear in mind, Liverpool have earned a spot in at least the Europa League qualifiers, as Carling Cup winners. There will be seven matches played at 10:00 a.m. Eastern, 3:00 p.m. in England. Chelsea enters the weekend five points out of a Champions League place and level with Newcastle for a Europa League spot. The Blues are on the road this week, facing an Aston Villa side that, you'll recall, did not come to play at the Emirates last week, but did win the reverse fixture in West London. Elsewhere, Manchester City will look to keep pace with United and bounce back from their draw last week, as they host Sunderland at Eastlands. It's a relegation six-pointer at Molineux as a quickly unraveling Wolves side will host Bolton Wanderers. Wigan, fresh off their win at Anfield will look to pick up three more points as they host Stoke at the DW. Meanwhile, two mid-table clashes take place as Everton hosts West Brom at Goodison Park and Fulham hosts Norwich at Craven Cottage. Two matches take place on Sunday. The early game will see Newcastle host Liverpool. The Magpies (oh right, I was calling them the Seahorses now, wasn't I?) enter the weekend eight points clear of seventh place Liverpool. The Reds desperately need this win to keep from going further down the rabbit hole. In the late game, Tottenham Hotspur, who enter the weekend three points back of the Gunners, will host Swansea City at the Lane. Spurs are now five league matches without a win. The last game of the weekend takes place on Monday, as Blackburn Rovers host Manchester United. Recall, on New Year's Eve, Blackburn pulled off a shocking win at Old Trafford. These are the reverse fixtures of those played on December 30-January 1.